Say hello to English Greening, one of the latest bears in our Apple Varieties collection. He is 3 1/2" tall and is made of very short, velvety soft white Schulte mohair. 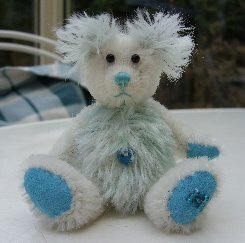 His tummy and ears are made of pale turquoise hand dyed South African mohair with a longer pile length and a more tufted texture. The colour is very pale and subtle and we have picked out the turquoise shade for his pads and paws which are made of deep turquoise ultrasuede, he has a turquoise stitched nose and shiny black English glass eyes. He is steel shot and glass bead filled so has some weight and as you can see, he is a really cute bear. I do hope that you like him, he costs £36 plus postage. Please note that as with all our bears, English Greening is not a toy and is not suitable for children. Sorry - English Greening has been adopted.